We check into Next Motel as photographer Benjo Arwas focuses his lens on the men of Next Models Los Angeles. Disrupting a moody evening, stylist Erik Ziemba steps in with a phenomenal wardrobe. 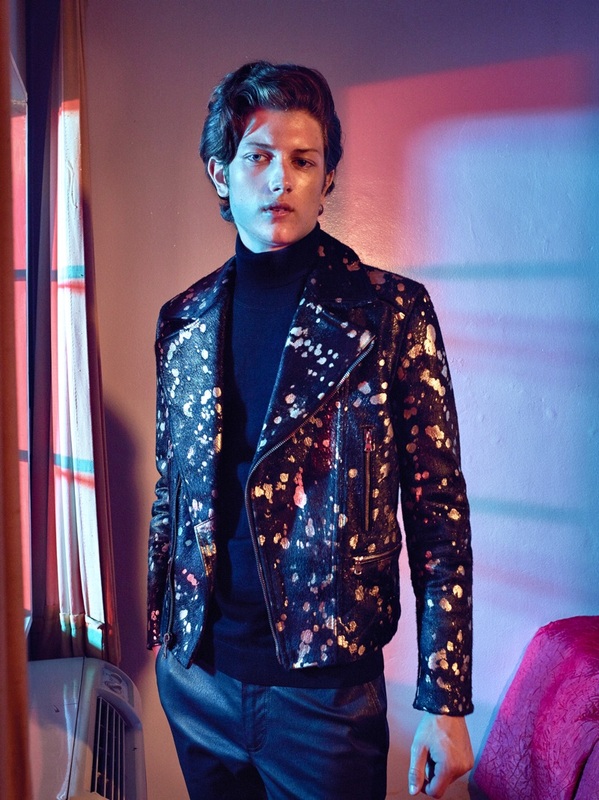 Impressive menswear comes together, featuring fashion brands such as Dolce & Gabbana, Jeffrey Rüdes, and Hugo Boss. 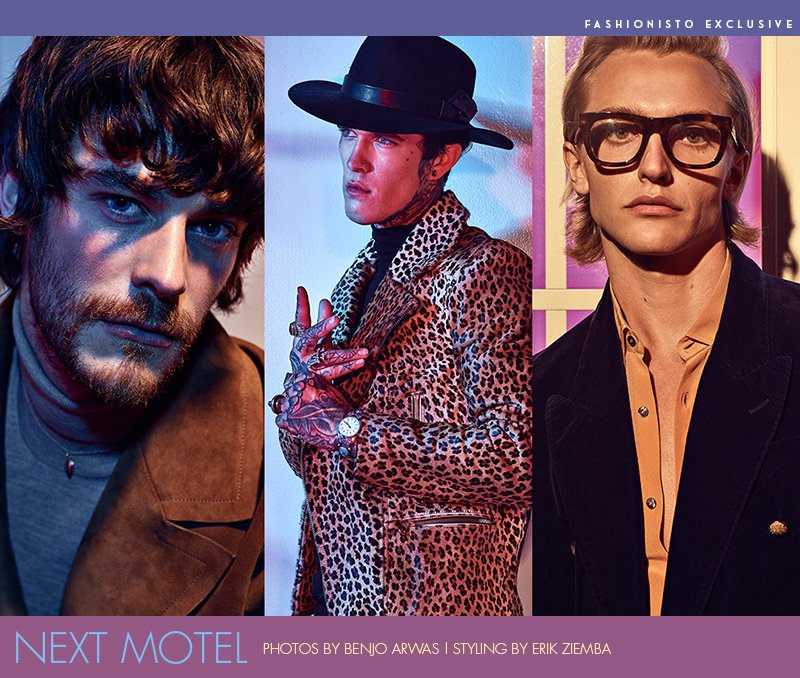 Showcasing an infinity for both classic tailoring and on-trend sportswear, Next models are front and center with stars such as Jimmy Q, Daniel Hivner, and Jonas Kesseler. / Grooming by Jaime Diaz. Assistance by Brandon Wholihan and Nate Mandurrago. Cinematography and video production by Sam Haskell. Video editing by Etienne Nong-Lambert. Jimmy Q dons a silk robe by Menagerie. Ryan Valentine dons a Gladys Tamez Millinery hat with a Jeffrey Rüdes shirt. 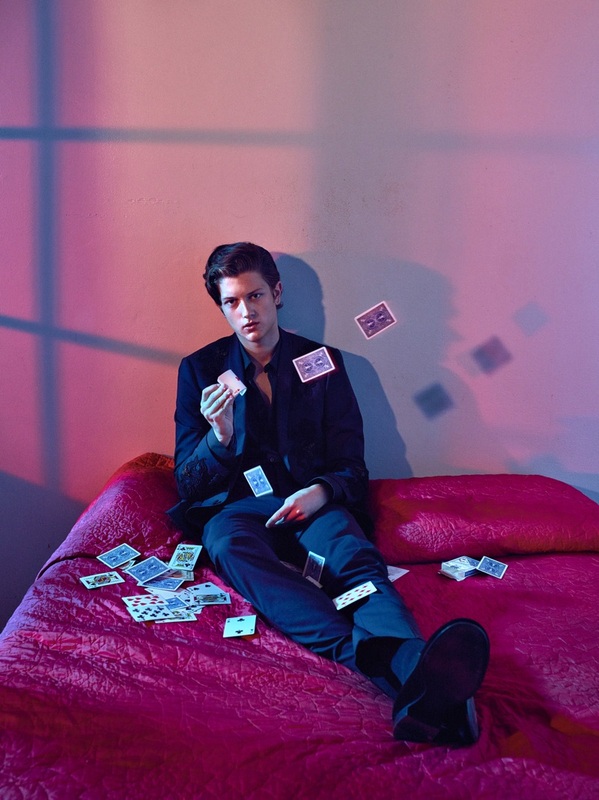 Sam Evans passes time with a deck of playing cards. Going sleek in black, Sam wears a Dolce & Gabbana look with Giuseppe Zanotti shoes. Josh Beech taps into Dolce & Gabbana's western themed fall with a patterned shirt and detailed pants. Daniel Hivner embraces a bohemian cool in a striped look from The Kooples with a Gladys Tamez Milinery hat, and RETROSUPERFUTURE sunglasses. Embodying a cool image, Andre Lamone models a jacket by The Kooples with a Hugo Boss turtleneck, Jeffrey Rüdes pants, and a Gladys Tamez Millinery hat. 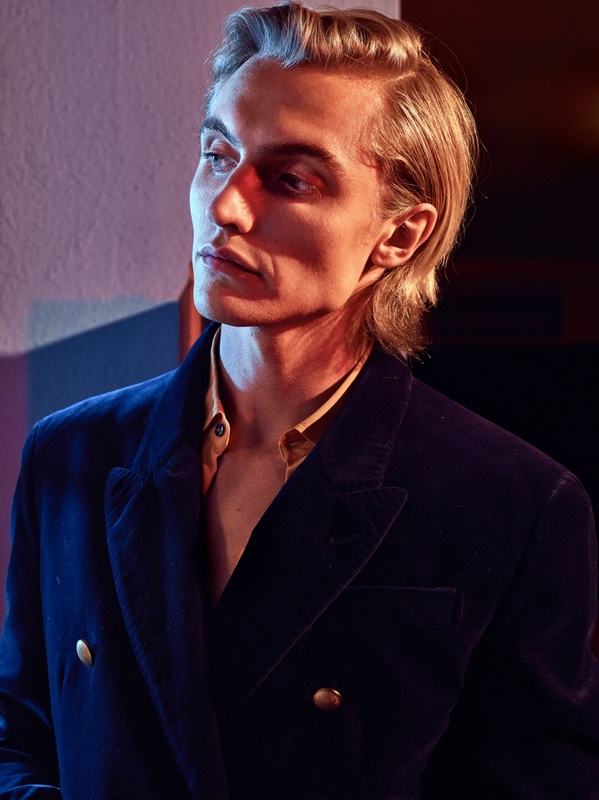 Tapping into a rock 'n' roll edge, Kaleb Ressler wears a Sav Noir jacket with a tank, scarf, and pants from The Kooples. Kaleb also sports Dolce & Gabbana dress shoes. 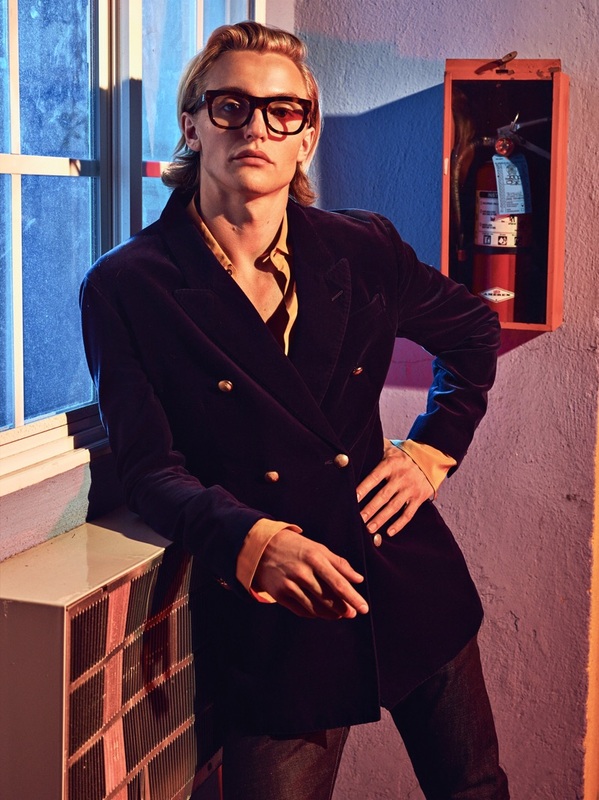 Hart Denton finds his inner dandy in a double-breasted Jeffrey Rüdes blazer and shirt with RETROSUPERFUTURE glasses. 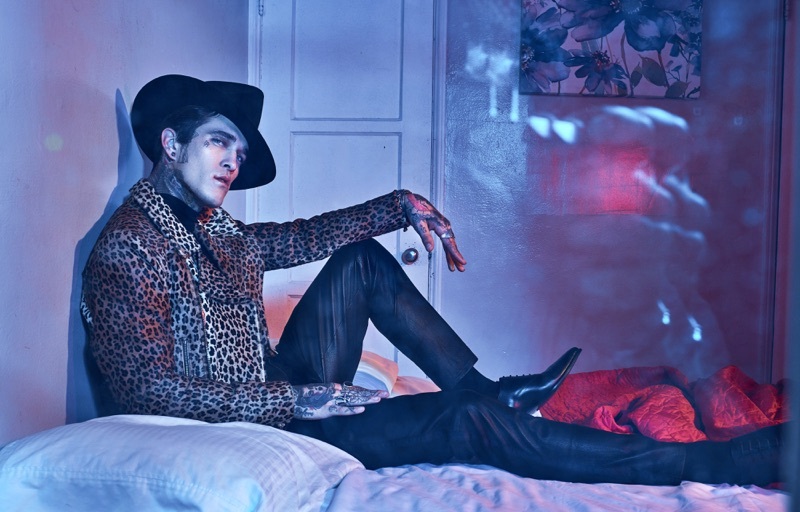 Rocking a rebellious look, Jimmy Q wears a Sav Noir leopard print jacket with an Ashton Michael Shirt and Gladys Tamez Millinery hat. The American model also models pants and shoes from The Kooples. Sam Evans rocks a Sav Noir jacket with a Hugo Boss turtleneck, as well as pants from The Kooples. Jonas Kesseler makes a brown statement in Jeffrey Rüdes double-breasted coat with tailored pants and shoes. The German model also sports a Hugo Boss turtleneck. Kaleb Ressler tackles dark layers in an Ashton Michael bomber jacket with a tank and pants by The Kooples. Model Hart Denton dons a double-breasted Jeffrey Rüdes blazer with a smart shirt.